Use PortfolioCVaR to create a PortfolioCVaR object for conditional value-at-risk portfolio optimization. The main workflow for CVaR portfolio optimization is to create an instance of a PortfolioCVaR object that completely specifies a portfolio optimization problem and to operate on the PortfolioCVaR object using supported functions to obtain and analyze efficient portfolios. For details on this workflow, see PortfolioCVaR Object Workflow. This syntax creates a PortfolioCVaR object, p, such that all object properties are empty. After creating a PortfolioCVaR object, you can use the associated object functions to set portfolio constraints, analyze the efficient frontier, and validate the portfolio model. For more detailed information on the theoretical basis for conditional value-at-risk portfolio optimization, see Portfolio Optimization Theory. 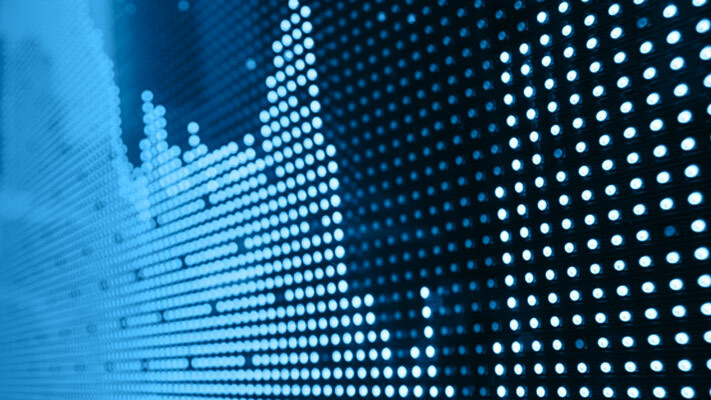 p = PortfolioCVaR creates an empty PortfolioCVaR object for conditional value-at-risk portfolio optimization and analysis. You can then add elements to the PortfolioCVaR object using the supported "add" and "set" functions. For more information, see Creating the PortfolioCVaR Object. p = PortfolioCVaR(Name,Value) creates a PortfolioCVaR object (p) and sets Properties using name-value pairs. For example, p = PortfolioCVaR('AssetList',Assets(1:12)). You can specify multiple name-value pairs. p = PortfolioCVaR(p,Name,Value) creates a PortfolioCVaR object (p) using a previously created PortfolioCVaR object p and sets Properties using name-value pairs. You can specify multiple name-value pairs. Previously constructed PortfolioCVaR object, specified using PortfolioCVaR. Names or symbols of assets in the universe, specified as a cell array of character vectors or a string array. Initial portfolio, specified as a vector. Name for instance of the Portfolio object, specified as a character vector or string. Number of assets in the universe, specified as an integer scalar. Linear equality constraint matrix, specified as a matrix. Linear inequality constraint matrix, specified as a matrix. Linear equality constraint vector, specified as a vector. Linear inequality constraint vector, specified as a vector. Group A weights to be bounded by weights in group B, specified as a matrix. Group B weights, specified as a matrix. Group membership matrix, specified as a matrix. Lower-bound constraint, specified as a vector. Lower-bound budget constraint, specified as a scalar. Lower-bound group constraint, specified as a vector. Minimum ratio of allocations between GroupA and GroupB, specified as a vector. Upper-bound constraint, specified as a vector. Upper-bound budget constraint, specified as a scalar. Upper-bound group constraint, specified as a vector. Maximum ratio of allocations between GroupA and GroupB, specified as a vector. 'Simple' (default) | character vector with value 'Simple' or 'Conditional' | string with value "Simple" or "Conditional" | cell array of character vectors with values 'Simple' or 'Conditional' | string array with values "Simple" or "Conditional"
Type of bounds for each asset weight, specified as a scalar character vector or string, or a cell array of character vectors or a string array. For more information, see setBounds. Minimum number of assets allocated in portfolio, specified as a scalar numeric value. For more information, see setMinMaxNumAssets. Maximum number of assets allocated in portfolio, specified as a scalar numeric value. For more information, see setMinMaxNumAssets. Turnover constraint, specified as a scalar. Turnover constraint on sales, specified as a scalar. Turnover constraint on purchases, specified as a scalar. Proportional purchase costs, specified as a vector. Risk-free rate, specified as a scalar. Value-at-risk probability level which is 1 − (loss probability), specified as a scalar. Number of scenarios, specified as an integer scalar. Proportional sales costs, specified as a vector. You can create a PortfolioCVaR object, p, with no input arguments and display it using disp. This approach provides a way to set up a portfolio optimization problem with the PortfolioCVaR function. You can then use the associated set functions to set and modify collections of properties in the PortfolioCVaR object. Note that the LowerBound property value undergoes scalar expansion since AssetScenarios provides the dimensions of the problem. If you did not specify the size of LowerBound but, instead, input a scalar argument, the PortfolioCVaR object assumes that you are defining a single-asset problem and produces an error at the call to set asset scenarios with four assets. You can create a PortfolioCVaR object, p with the PortfolioCVaR object using shortcuts for property names. Although not recommended, you can set properties directly, however no error-checking is done on your inputs. Scenarios cannot be assigned directly to a PortfolioCVaR object. Scenarios must always be set through either the PortfolioCVaR function, the setScenarios function, or any of the scenario simulation functions. A CVaR optimization problem is completely specified with four elements. A universe of assets with scenarios of asset total returns for a period of interest, where scenarios comprise a collection of samples from the underlying probability distribution for asset total returns. This collection must be sufficiently large for asymptotic convergence of sample statistics. Asset return moments and related statistics are derived exclusively from the scenarios. A portfolio set that specifies the set of portfolio choices in terms of a collection of constraints. 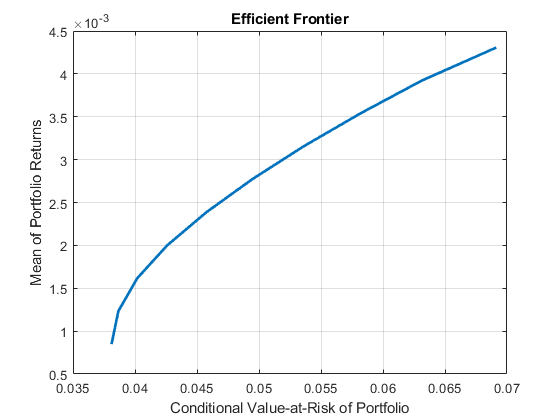 A model for portfolio return and risk proxies, which, for CVaR optimization, is either the gross or net mean of portfolio returns and the conditional value-at-risk of portfolio returns. A probability level that specifies the probability that a loss is less than or equal to the value-at-risk. Typical values are 0.9 and 0.95, which indicate 10% and 5% loss probabilities. After these four elements have been specified in an unambiguous way, it is possible to solve and analyze CVaR portfolio optimization problems. 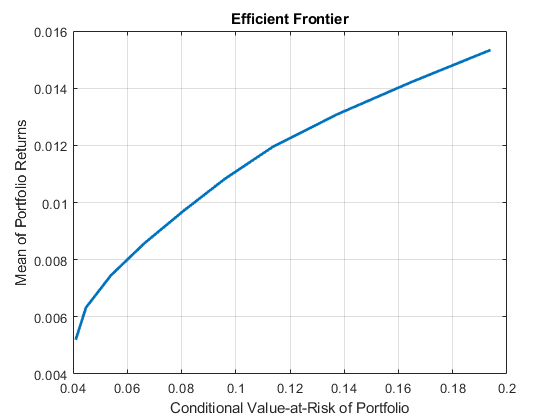 To confirm that this is a valid portfolio optimization problem, the following function determines whether the set of PortfolioCVaR choices is bounded (a necessary condition for portfolio optimization). 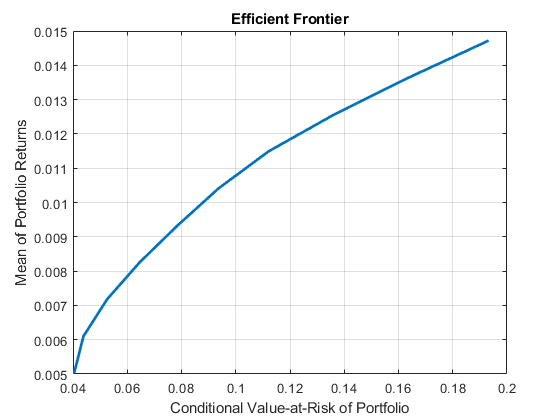 For more information on the theory and definition of conditional value-at-risk optimization supported by portfolio optimization tools in Financial Toolbox™, see Portfolio Optimization Theory. A CVaR portfolio optimization problem is completely specified with the PortfolioCVaR object if three conditions are met. You must specify a collection of asset returns or prices known as scenarios such that all scenarios are finite asset returns or prices. These scenarios are meant to be samples from the underlying probability distribution of asset returns. This condition can be satisfied by the setScenarios function or with several canned scenario simulation functions. The set of feasible portfolios must be a nonempty compact set, where a compact set is closed and bounded. You can satisfy this condition using an extensive collection of properties that define different types of constraints to form a set of feasible portfolios. Since such sets must be bounded, either explicit or implicit constraints can be imposed and several tools, such as the estimateBounds function, provide ways to ensure that your problem is properly formulated. You must specify a probability level to locate the level of tail loss above which the conditional value-at-risk is to be minimized. This condition can be satisfied by the setProbabilityLevel function. Although the general sufficient conditions for CVaR portfolio optimization go beyond the first three conditions, the PortfolioCVaR object handles all these additional conditions. The PortfolioCVaR object has shorter argument names that replace longer argument names associated with specific properties of the PortfolioCVaR object. For example, rather than enter 'ProbabilityLevel', the PortfolioCVaR object accepts the case-insensitive name 'plevel' to set the ProbabilityLevel property in a PortfolioCVaR object. Every shorter argument name corresponds with a single property in the PortfolioCVaR object. The one exception is the alternative argument name 'budget', which signifies both the LowerBudget and UpperBudget properties. When 'budget' is used, then the LowerBudget and UpperBudget properties are set to the same value to form an equality budget constraint. For a complete list of references for the PortfolioCVaR object, see Portfolio Optimization.